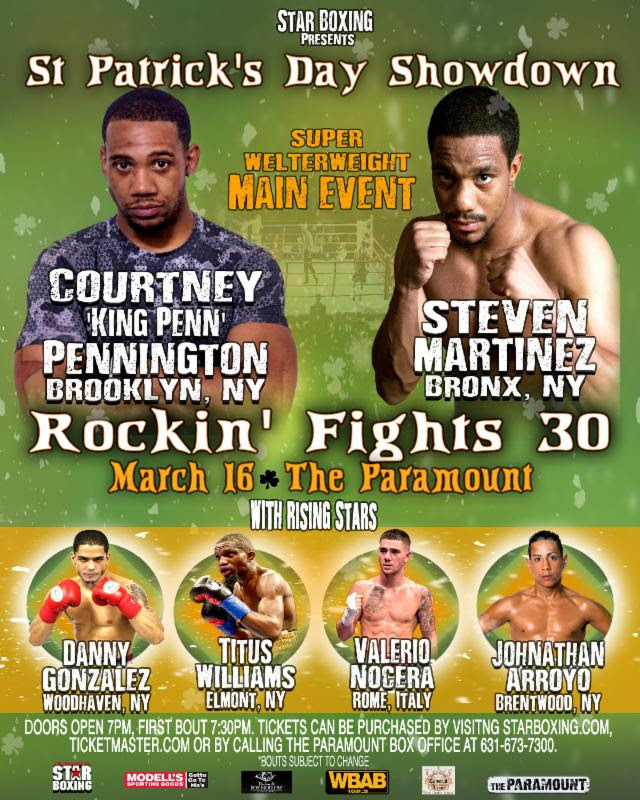 This Friday’s (3/16) ROCKIN’ FIGHTS at THE PARAMOUNT features a Brooklyn vs Bronx showdown between UBF champion COURTNEY “KING PENN” PENNINGTON (Brooklyn, NY 11-3-2 5KO’s) pitted against, STEVEN “HITMAN” MARTINEZ (Bronx, NY 18-3 13KO’s). 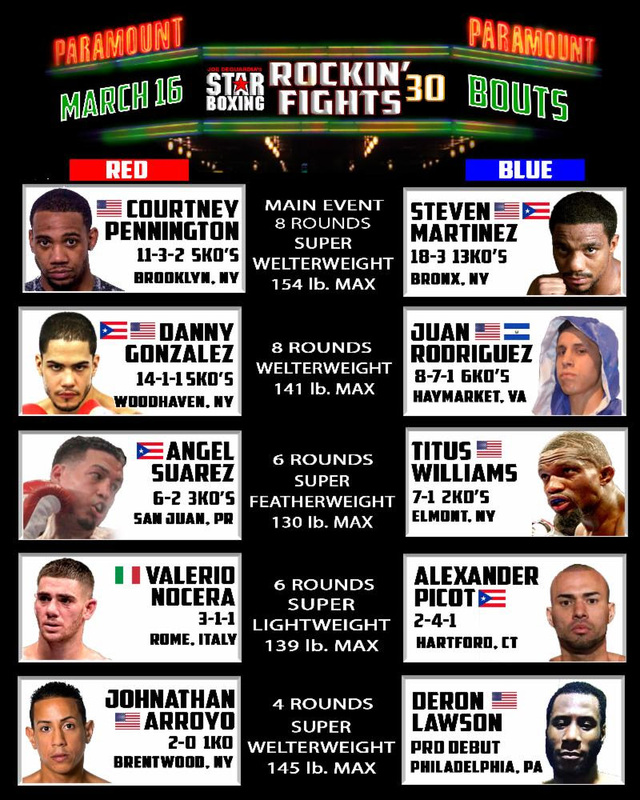 Along with a great main event, Rockin’ Fights will bring the heat with a stellar undercard. DANNY “EL GALLO” GONZALEZ (Woodhaven, NY 14-1-1 5KO’s) returns to The Paramount with his sights set on his seventh consecutive win at the venue. El Gallo packs the crowd with loyal fans, by using his crowd pleasing style. Across the ring will be sixteen fight veteran, JUAN RODRIGUEZ(Haymarket, VA, 8-7-1 6KO’s) who is coming off of a strong bounce back, TKO win performance in September. This is a scheduled 8-Round welterweight bout. ANGEL SUAREZ (Guaynabo, PR 6-2 3KO’s) returning to the Paramount for the second time will look to use his speed and agility to overwhelm his opponent TITUS WILLIAMS (Elmont, NY, 7-1 1KO) who will be fighting in his home state of New York for the second time in a row. Suarez is looking to extend his five fight win streak to six, while Williams is looking to get back in the win column after suffering a loss at the Barclays Center in November of last year. This is a scheduled 6-round featherweight bout. Italian boxer VALERIO NOCERA (Rome, Italy 3-1-1) will be fighting in the United States for the second time in his career, against a formidable ALEXANDER “EL BRAVO” PICOT (Hartfrod, CT, 2-4-1) who will look to use his relentless pressure in order to secure a victory. Both fighters are coming off losses and each is determined to avoid making it two in a row. This will be a scheduled 6-round super lightweight bout. Kicking off the show is undefeated prospect, JOHNATHAN ARROYO(Brentwood, NY, 2-0 1KO) as he steps into the bright lights of The Paramount for the first time in his young career, coming off an impressive TKO victory in February. He will face, DERON LAWSON (Philadelphia, PA, pro-debut) who will look to start his professional career in the win column. This bout is a scheduled 4-round super welterweight showdown.